The first JumpThe stars were rich in population. I had never seen so many at once. Dots scattered all over that black canvas, god there were so many. They flew by me faster then I could see, faster then any light I have ever seen. This was my first jump. They all say that the first jump was the hardest. I didn't think so, I had been waiting for this my entire life. From the very moment I stepped onto this ship, I did not feel any regrets of the decision I was making. When I reached the space station that orbits high above my world, and to the very moment I floated into the ship that would carry me I knew that this is where I belonged. Here in this space. They come and go, like the tides of the oceans. Stabbing subtly, but enough to irritate. And finally your love, buried under crumbled concrete. Just waiting to be unburied, waiting for the right move. I couldn't tell you what lies, or truths to trust. Lies become the truth should you wish for it. The truth can become lies if you reject it. Take the good and the bad, and then see the middle. And to disappear to the depressing world in that blue canvas. The Imperium of ManIn the Ancient times, when man was still on his origin world, he fought bitterly against himself. Every generation knew some great battle, or war. It was not a matter that could be defined as something to escape, but it was a matter of human nature. Competition for survival of the fittest. In the deepest depths of space, there existed the Alliance of Space Ascended Races. The Alliance was assembled to create a union of alien races that could help each other out, and eliminate the loneliness that had struck them all when they made their first stabs into space. The Alliance is at war though, against an ancient battle relic. A ship that calls its self, the Vessel of Truth. It was designed to be the ultimate weapon in the war that the ancient races were battling. It was designed to analyze, develop, and construct a means of offensive and defensive operations. It was a fully resourced battle tactical AI. The Empire's New WeaponWhen the Alliance came to our world, they had great vessels that were more powerful then what we had ever encountered. Though their own encounters with a force so powerful that it forced their advancement. Their ships are enormous; the largest recorded ship size was that of half of our moon's mass. Also, they had shielding systems that we now employ in our STA drives. 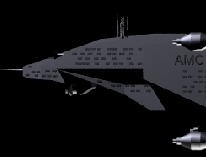 Because of this, we have to develop new weapons specially engineered and designed to combat Alliance vessels.